3. Ada Emma Noble b. 1855 – d.1944. – Emmanuel Noble, married age 36, Roper, born Dorking, Surrey. 9 Russell St, Luton, Chatham. 1. Emmanuel Noble (Head) age 35, Officer R.N, born Dorking, Surrey. 2. Emma Julia Noble (Wife) age 32, born Dorking, Surrey. 3. Albert E Noble (Son) age 10, Scholar, born Sheerness, Kent. 4. Ernest V Noble (Son) age 7, Scholar, born Chatham, Kent. 5. Ada Noble (Daughter) age 5, Scholar, born Brompton, Kent. 6. Florence E (Daughter) age 11 months, born Portland, Dorset. 3 East St, Luton, Chatham. 1. Emmanuel Noble (Head) age 45, Rigger HM Dockyard, born Dorking, Surrey. 2. Emma Julia Noble (Wife) age 42, born Dorking, Surrey. 3. Albert E Noble (Son) single, age 20, Baker Journeyman Breadmaker worker, born Chatham, Kent. 4. Ernest V Noble (Son) single, age 17, Ship fitter labourer of iron worker, born New Brompton, Kent. 5. Ada Noble (Daughter) age 15, born Portland, Dorset. 6. Florence E (Daughter) age 10, born Chatham, Kent. 7. Daisy E Noble (Daughter) age 9, born Chatham, Kent. 8. Charles F Noble (Son) age 7, born Chatham, Kent. 1 Mill Cottage, Mount New Road, Chatham. 1. Emmanuel Noble (Father) age 55, married 21 years, 6 children born (all still living) Naval Pensioner, born Dorking in Surrey. 2. Emma J Noble (Mother) age 53, born Sheerness, Kent. 3. Ernest V Noble (Son) age 27, single, Engine Fitter Ship Construction (worker) born New Brompton, Kent. 4. Daisy E Noble (Daughter) age 19, single, Manageress to bakers confectioners, born Chatham, Kent. 5. Charlie F Noble (Son) age 17, single Fitters, Improver Engineering (worker) born Chatham Kent. This entry was posted in French, Noble, Surnames and tagged Chatham, French, Kent, Medway, Noble on 21st April 2015 by admin. Emmanuel Noble was born 13th April 1855 in Dorking, Surrey (according to his Continuous Service Record) and died 1923 in Medway. 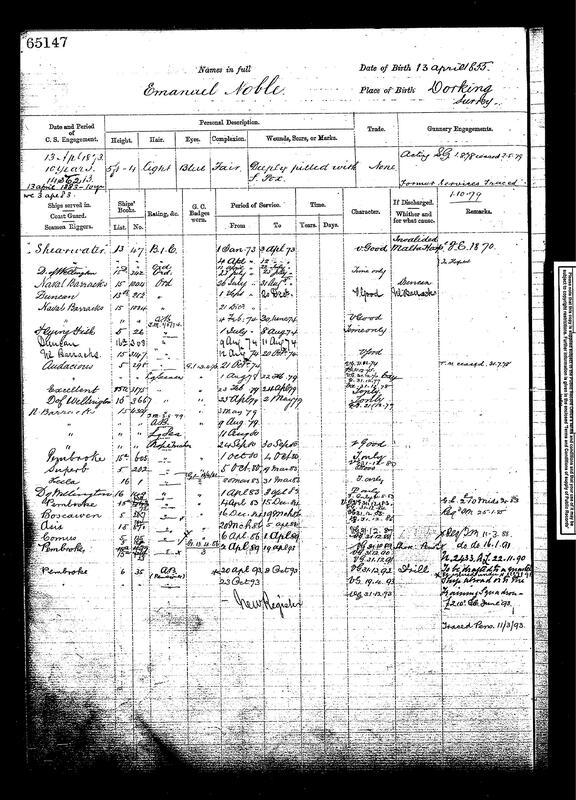 Although all the records I’ve found give his place of birth as Dorking in Surrey – frustratingly, I can’t find a birth or baptism record for him. Emmanuel Noble: Age 24, Bachelor, Sailor HMN. Fathers profession: Machinist?? (NB Hard to read the entry). 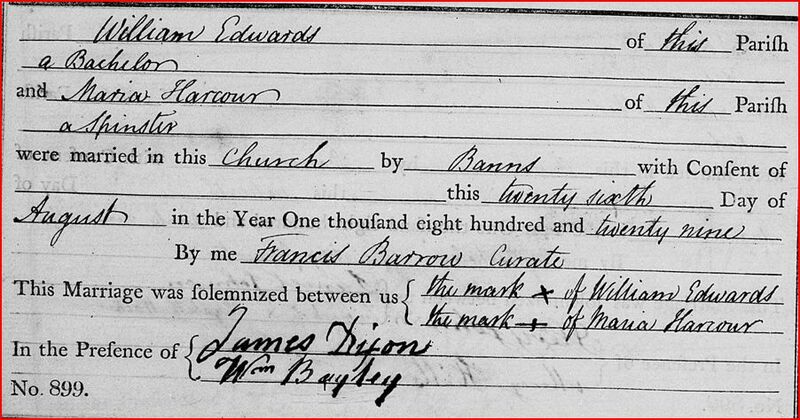 Spouse: Emma Julia French, Age 21, Spinster. 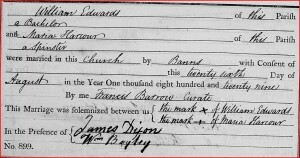 Marriage Witnesses: John Thomas Taylor and Sophia Ann Taylor. Character: Described from ‘good’ to ‘V good’ to ‘excellent’. Under George Strong Nares and later William Wharton (later Hydrographer of the Navy) HMS Shearwater surveyed around the Mediterranean and the East coast of Africa. In 1873 the ship was determining the meridian distance between Gibraltar and Malta. (Reference page 47). From 1863 onwards HMS Duke of Wellington served as the receiving, depot and barracks ship at Portsmouth, remaining as such until scrapped in 1904. Naval Barracks: 26th July 1873 to 31st August 1873; 21st Dec 1873; 4th Feb 1874 to 30th June 1874. Buncan (or possibly Duncan – hard to read the record): 1st Sept 1873 to 20th Dec 1873; 9th Aug 1874 to 11th Aug 1874. HMS Flying Fish commissioned at Chatham, building costs amounted to £39.445. In 1874 she then sailed for a four-and-a-half year commission on the East Indies Station, and engaged in suppression of the slave trade on the east coast of Africa. The ship was at Madagascar when all the slaves who had been taken to the island were given their freedom. (ref: www.worldnavalships.com) (www.shipstamps.co.uk). W Barracks: 12th Aug 1874 to 20th Oct 1874. (further info) When Emmanuel worked on this boat HMS Audacious was a guardship at Hull 1871/4. The Audacious paid off for re- commissioning as flagship on the China Station (1874/8) during which time she was involved in a collision at Yokohama during a typhoon. She then paid off at Chatham in 1878 and went back to Hull as guardship See also: www.worldnavalships.com / (Print of the ship in 1869). H.M.S. Excellent, also known as Portsmouth Gunnery School or Whale Island. This was the British Royal Navy’s main gunnery training establishment. N Barracks: 3rd May 1879 to (doesn’t give a date); 11th Aug 1880 to (doesn’t give a date); 24th Sept 1880 to 30th Sept 1880. HMS Superb was commissioned at Chatham for service in the Mediterranean on 4 October 1880, and remained on station for seven years. She took part in the bombardment of Alexandria 11–13 July 1882, where she fired 310 shells of 10-inch calibre at the Egyptian forts; she received ten hits in return, seven of them on her armour, with no casualties. Recla?? 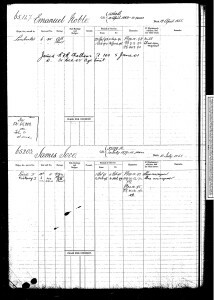 It’s difficult to read the record, possibly reads HMS Hecla a depot ship (thanks for the info Martin Brown) 20th March 1883 to 31st March 1883. Commanded by Commander George Bruce Evans, training ship for boys, Portland. Asis?? (hard to read the record): 20th March 1886 to 5th April 1886. After a refit HMS Comus recommissioned 6 April 1886 for service on the North American and West Indies Station. In 1889 the ship transported scientists to observe the total eclipse of the sun off western Africa. Noted astronomer Stephen Joseph Perry died aboard the vessel from dysentery contracted ashore. 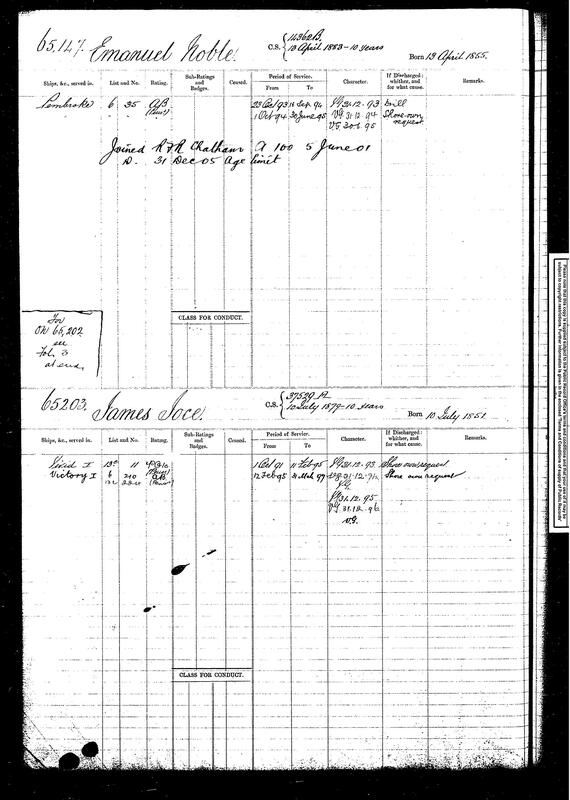 In the 1901 census his profession was given as ‘Rigger, HM Dockyard’ and in 1911 he was a ‘Naval Pensioner’. 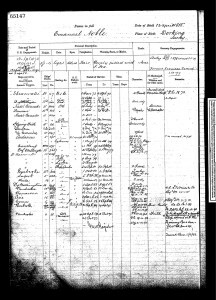 This entry was posted in French, Noble, Surnames and tagged Chatham, Chatham Dockyard, French, HMS Audacious, HMS Boscawen, HMS Comus, HMS Duke of Wellington, HMS Duncan, HMS Excellent, HMS Flying Fish, HMS Pembroke, HMS Shearwater, HMS Superb, Kent, Medway, Noble, Ropemaker, Ropemaking on 21st April 2015 by admin.